The main difference between a blog and business is the investment. Consider starting a brick and mortar store, you do have to invest the rent, the furniture, the employees to help you manage, you name it. The same is with your blog too! Not investing on your blog, at the right time is one of the top blogging mistakes to avoid that might be crippling your income goals. If you want to earn from your blog, you have to invest in it, may it be our time, your efforts or your money. In this article, I’ll list the most essential content creation tools that’ll help you in blogging by not only saving the time you spent on blog content creation but also content marketing as a whole. Most people don’t make any money from their blogs. They don’t invest any money on their blogs. They start a blog to make money but without investing even a penny. Hard work alone cannot bring results. You have to be smart and make some decisions that will help you save time and use that time in other productive works. Any profitable blog needs investment in design, using proper tools and plugins. So if you want to take your blogging efforts to the next level, make sure to invest money on few essential content creation tools that blogger/writer should have. Not all are paid tools, there are a load of free tools like our popular grammar cheat sheet PDF which you can download for free. These tools will not only help you to create better content and drive more traffic to their blog, but also will save your valuable time which you can utilize in some other aspects of your online business. In this post, you will find 10 of the most incredible blogging tools to make content creation simple and more effective. Are you curious to find them out? Looking to quicken up your content creation process? Want some tools and apps to help you in coming up with great content marketing strategy? 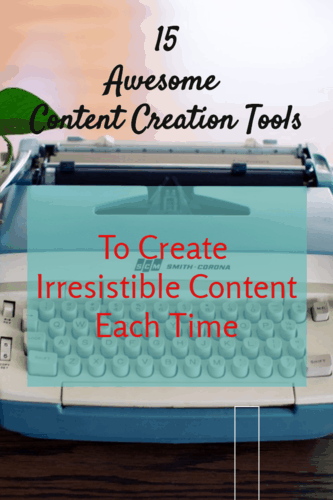 Here are 15 of the best content creation tools that will help you refine your content and get more readers to it. Almost all of these tools are free or have a free trial so that you can see which content creation software is best for you. Your website content creation process starts with finding blog post ideas. Without coming up with amazing ideas for your blog posts, you won’t be able to build loyal audience around your blog. It’s a simple fact. Coming up with better blog post ideas that drive more traffic is not a joke. It usually takes a lot of time and efforts to get amazing ideas. If you are also one among them who is struggling to come up with new post ideas, I’ve a great suggestion for you. Start using Quora to come up with blog post ideas. Quora is a great Q & A (Question and answer) platform where you can find valuable answers on almost every topic under the sun. This is also my go to content development tool that helps me find what problem my community is facing and what topics my niche has trending. If you are not using it yet, I highly recommend you to sign up for it (free) and start following the topics that are relevant to your blog’s niche. That way you will get post notifications whenever someone writes answers related to those topics. 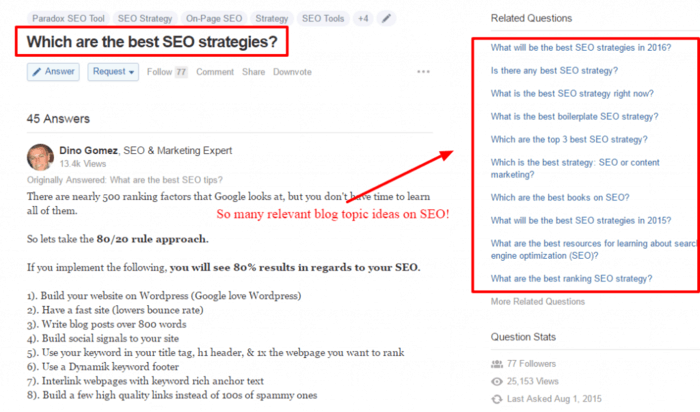 If you are wondering how to use Quora to come up with blog post ideas, here’s what to do. Step 1: Follow the topics you are interested in, also make sure to follow your blog topics. Step 2: Find all the questions that you have not covered on your blog yet. Find out which questions got more upvotes, comments or views. That way you will be able to find out the hot topics in your niche. For instance, have a look at the below screenshot. You will find a lot of topic ideas to write on your blog just by looking at Quora answers. Likewise, you can also ask any questions to get the best answers from the Quora community. These can be curated into a blog post for used as ideas for blog content. Step 3: Start writing on the topics you find most interesting and valuable to your blog audience. My top pick is a tool that I cannot live without. Grammarly has changed the writing experience for me and millions like me. It comes as a browser extension, MS Word add-in and as an app for you to access across any platform. No doubt it is the best web-based content creation and editing tools out there. Read my detailed Grammarly review to know more. Ever worried about where to place those commas? Do you get confused about the active and passive voice in your writing? Check the spelling and punctuation errors in my copy. Check for duplicate content in my articles before sending them to client. To optimize my content based on the client I am writing for. I mean with Grammarly I can check my health niche content keeping the health field and terminology in mind. Similarly it can also help you check your academic papers and commercial papers separately. For proofreading my content, before I publish them. To check silly grammatical errors like checking comma splices in emails and social media content. You can avail Grammarly at 20% Discount by clicking the link here (the Grammarly discount coupon is exclusive to DigitalGYD readers). I promise this will be my last thrive product in the post. I am not biased towards them, but I happen to be someone who has been benefited immensely from their products and I want you to experience that. Your headline is what drives traffic to your site. The headline is the first that your readers will notice on a search result page and the headline is what will make your readers stay to read the post inside out. With Thrive Headline Optimizer, you can split-test different article headlines and check the best performing ones based on click through, reading time, engagement rates etc. THO automatically find the best performing one so that you can switch the titles easily. Most tools like portent’s title generator and Coschedule’s headline analyzer will tell you which headline would fit your blog article, but Thrive’s headline optimizer will actually do the testing to see what works real-time on your blog. Plain content is what every John Doe writes. If you want to stand out and make your content really pop out, you gotta do something interesting. With Thrive Architect, you can create animated blog posts, sticky content. This is what every affiliate blogger (even me) is using to boost sales and conversions. You can create custom blog page layout, add animated call-to-action buttons and much more without even touching a single line of code (look at my toolbox page, isn’t it amazing?). All these was done in less than 30 minutes with Thrive architect, no coding skills required, no need to hire any expensive designer. An editorial calendar is a important tool for writers who don’t want to miss their writing schedule. With an editorial calendar, you can see your whole month or year as a whole and decide what to post and when to post. I personally use the free WordPress editorial calendar which helps me to see all my posts at a glance, drag and rearrange them and even edit them from the plugin dashboard itself. If you don’t mind spending a penny or two, you should consider checking Coschedule out. Our friends over at Coschedule have the most advanced content planning plugin out there. You can even plan your social media calendar right from the dashboard. Having click-worthy content is of no value if you don’t have a well-designed blog to showcase your work. Having a clean theme is essential to make your content enticing and read-worthy. 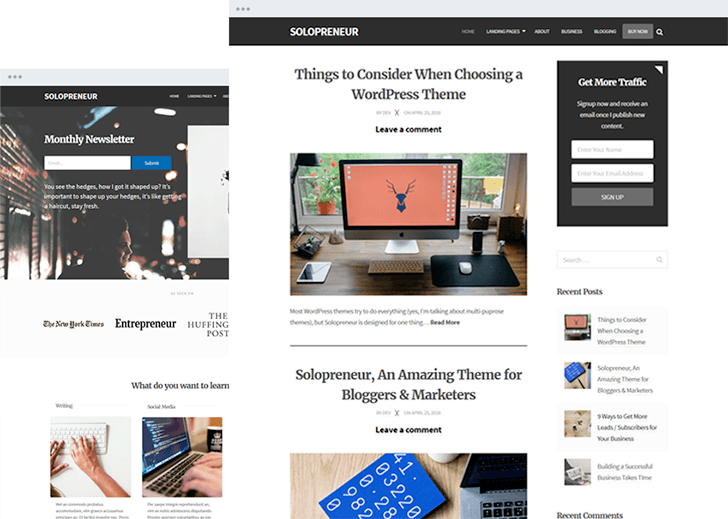 Solopreneur is a recently launched WordPress themes for bloggers and Marketers. This theme has earned rave reviews from everyone and is by far the best minimalist WordPress theme for solopreneurs and writers. It also has two inbuilt landing pages to create awesome pages to capture leads. The default optin box in the sidebar and below the blog articles are also designed to turn readers into email subscribers. This is a perfect WordPress theme with beautiful email subscription widgets. As I said earlier in the post about the importance of building an email list to grow your online income, it’s essential to build a massive list to get more rewards. Building an email list is easy but growing it is not. Most beginners struggle to build their email lists even after using the lead magnets. If you are searching for proven ways to growing your list rapidly, start using the simplest lead generation platform “ThriveLeads“. It is not only used for generating leads but it also can be used for increasing your website sales. It’s the #1 landing page software which has the most simplest drag and drop interface you can use to building stunning landing pages. Recently my blog was hacked. Luckily, I had backup of my whole website files so I retrieved all of the data immediately. What if I had no backup stored? I’d have paid a lot of money to my hosting service in order to retrieve the files. You never know when and how your websites might get hacked. WordPress sites (and even WordPress alternatives) are prone to hacking because of weak passwords and plugin vulnerabilities. So it’s always better to have regular backups of your whole site so you can have peaceful sleep at nights. Although there are so many tools and services out there to safeguard your content and take regular backups of your WordPress sites, I strongly recommend you to start using VaultPress (I’m also using the same stuff). A picture is worth a thousand words. Your blog content goes viral if it has appealing images. Unfortunately most bloggers and marketers don’t leverage visual content to create irresistible content because they are either not good at designing images or don’t want to spend too much on blog graphics. If you are also thinking the same, I’d recommend you to start using Canva, one of the best visual content creation tools. It’s most effective and simplest blog graphic design software used to create blog images, graphics, logos, Infographics, Facebook covers, posters, you name it. It has a drag and drop interface which allows you to simply select an image and write text and download it to start using on your blog to get more exposure. Editor’s note: Canva is a must-have tool in my writing portfolio. I have used canva to create awesome featured images for my blog and my clients’ blogs. Elna Cain, a freelance writer friend of mine also used images to impress and get new clients. Creating great content is not enough. If you want to increase your blog traffic and bring more exposure to your content, you have to promote. There’s no better way to promote your stuff other than using social media. I know sharing your links every single time after posting is a tedious job. Here’s where SocialPiot (read my SocialPilot review) comes into play. It’s the easiest way to share your content across all social media platforms like Facebook, Twitter, Google+ etc. You can also schedule the posts or tweets in advance and Buffer will share the content accordingly. Use Social Pilot which offers many features like direct sharing from canva etc. Before showing you the next 5 tools, let me ask you something? I always believe in work smart, not hard. Do you? So, here are the next 5 tools/resources for that awesome content creation experience that just help you work smart. And get more results with less effort. Building an email list is a must if you want to make money from your blogging efforts. See, your blog is not a money making machine but your email list is. That’s where all the money is. The more you nurture your email subscribers with your emails the more sales you can make. But, how can email marketing help you create better content? With an email marketing tool, you can deliver your awesome blog posts directly to your readers. You can do this by automating (sending emails automatically whenever a new post is published) or by manual means (creating a customized email every week that shows what posts you’ve written and what are you up to). The latter helps you to build an authentic relationship with your readers and eventually turn them into your die hard fans. You can start building an email list with an autoresponder software. If you are a beginner who is looking for the best email marketing software, I’d highly recommend GetResponse. That is what I use and I am loving it so far. They are affordable, reliable and allow you to build stunning landing pages along with building and growing your email list. Their service is used widely, they have higher deliverability rate (more than 99%) and they have an easy to manage interface (to add, import or export contacts). To add to that, they are free to start with. Did I forget to say you can create appealing newsletters by using their gorgeous default email newsletter templates? Coming up great topic ideas is one part and writing optimized content around it is another part. If you are not optimizing your blog posts for search engines, you are never going to get massive search engine traffic. It’s as simple as that. So what can you do to easily optimize your content? Start using WordPress SEO by Yoast. It’s a free SEO plugin developed to boost your search engine rankings by optimizing content. It also helps you where to put your keywords to get prominent search rankings. Even if you are a beginner who knows nothing about search engine optimization, you will still find this tool easy to use. All you have to do is to pick a primary keyword and optimize according to the tool suggestions (placing keyword in image alt tags, meta description, title, body etc). Did you know the easiest way to increase your overall website traffic from search engines? Finding low competitive keywords and using them on your content while writing is the surefire way to boost your search rankings even if you have a new website or blog. And not just any keywords, they have to be “long tail keywords”. Long tail keywords are longer search queries that 4-5 words long or even longer. These are very laser -targeted at what the user wants or expects the ranking article to be. Since long tail keywords can be easily ranked for because most authority sites are busy ranking the exact match keywords. A long tail keyword contains more than 4 to 5 keywords in it. Finding long tail keywords is extremely easy with Kwfinder. It’s a freemium keyword research tool designed to come up with tons of low competitive long tail keywords in any niche (offers 5 keyword searches for free each day so that should be enough for you to get started). Check out how I use KWFinder to find, profitable, easy-to-rank, low competition keywords easily. Buzzsumo is another great blogging tool for all kinds of bloggers and marketers to come up with exceptional blog post ideas. It’s also helpful for spying on your competitors best performing blog posts. If you want to find the most shared content in your niche, there’s no better alternative to Buzzsumo. It will give you all the details after entering a keyword or domain name in their search bar along with the backlinks, social shares count. That is why I call it the ultimate content creation software. StudioPress Hosting Review complete solution with website, genesis themes, hosting, podcast platform and lead gen forms. Host1PLus review: Cheaper hosting plus secured servers. You can also use it find and connect with the key influencers in your niche so you can build strong relationship, create better content and drive more traffic to your websites. They also have a free version which can be sufficient to get the most out of it. I mostly use BuzzSumo to find out trending topics in my niche and write content optimized for them. You can also use it to find the backlinks of each of the post that appears for your search term and also the people who have shared the content. This is extremely helpful in as far as link building is concerned. With SEMrush, you can do almost anything related to SEO from analyzing website of anyone to finding best performing keywords of your competitors to conducting website audits to find and fix your website issues. I’d say SEMrush is an all-rounder SEO tool and widely recommended by SEO experts. If you are still wondering why should you start using it, there are 4 out of 100 great reasons. Keyword research (you can find really low competitive keywords no matter what your niche is). Head over to my SEMrush review and download free SEMrush tutorial worksheet along with 30 day free access to the tool to make the best of it. You can get all the above features and improve your search results by just paying $69 per month or try it free for 30 days . I’ve been using it for over a year now and I’m very happy with the results that I get with it! When we talk about WordPress, the first thing that comes to our mind is the plethora of plugins and tools it supports. If you are serious about making money blogging, don’t go beyond WordPress as it is the #1 content management system in the world. Although there are a TON of blogging apps and plugins out there, I’ve only mentioned the most effective tools in the above list. These are the tools I personally use and these have helped me create irresistible content that gets traffic like crazy. Some of them are free and some of them cost you money but they are absolutely critical for you to build a successful blog that makes money. What tools and apps do you think are essential for every blogger and writer? Do you have any more free or premium content creation tools and apps to recommend? Hi Swadhin! Impressive list you got here. I don’t use all these tools on daily basis, but I can see how beneficial they are. I’m actually considering in investing in some of them to help me be better at writing and promoting content. It really isn’t as easy as we, bloggers and professional writers, make it look like. The content reads so simple and is so engaging, you think it was written in 30 minutes, while it actually took days of research, planning, drafting, and editing before the final copy gets published. It’s a long process that many people just don’t know about. Thank you for sharing these helpful tools. I’ll make sure to check them some of them soon. Hi Bro, firstly Thanks for great post. its help me more. I used quora platform with seriously since one year. and I Find questions not covered on my blog. Thanks one second. This is great post for me this morning, this article on best content creation apps made my day. Making quality blog post content is not that easy but with some of these tools listed above, I can make things flow well. I love visiting quora , that’s my best post idea generator. I also use keyword revealer to find competitors keywords and keyword difficulties. Have a nice day bro..
Great advice here on investing in your business. The next phase in improving my own blog is to re purpose my content so I can get more mileage out of it, which is where buffer and canva come in. I’ve noticed many bloggers pulling out quotes and tweeting them. It seems like a great way to use existing content. Glad to sneak into your post at Swadhin’s place! I must say that I am using not all but a few of those mentioned tools! Quora, Grammarly and Canva are the best! I am to push myself to acquire Thrive’s related products soon to add into my inventory so that I get the full outcome out of the content! Good roundup, I must say. I have been addicted to Quora of late as it’s a great source of information, let alone blog post ideas. I recently stumbled across Canva and it has become my favourite design tool! It was Informative and Worthy post. If you have a real passion for writing then definitely Blogging is having lots of scope in it. Blogging is an effective tool to promote the small business and trades. Many of the writers even the professional uses many effective tool for their writing. It really helps them to write error free and saves a lot of their time & effort. The main objective of any blog is to get more no of influencers as possible. There are various tools that help to rank your website on top of Google as discussed by ANIL. I have been using all the free tools mentioned here. Never used the paid ones because either they cost a bomb or they were subscription based. And I prefer not to fall for monthly payments because its a huge liability. Welcome over here. That is so true. Most paid tools out there have now enabled subscription based pricing models. Thanks for reading it and sharing your view.